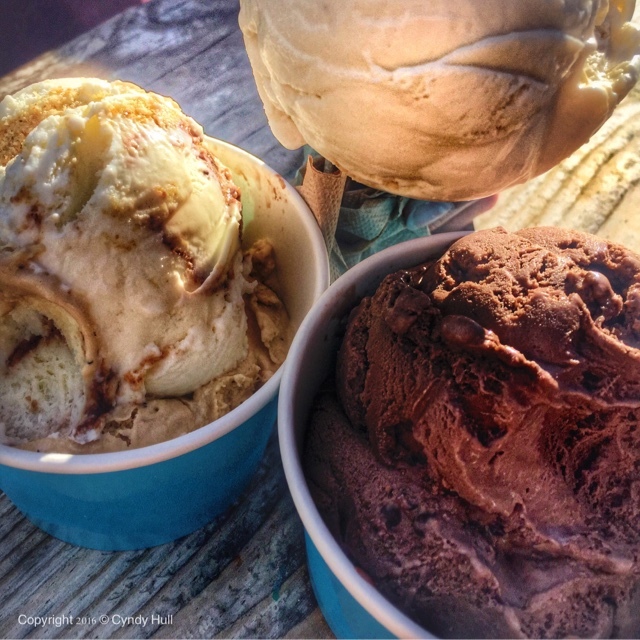 From left to right, clockwise: S'mores, Salty Caramel, Chocolate Love. All locally made from scratch from real ingredients, the Sweet Peaks way. Which inspires so much loyalty that I was at Sweet Peaks twice last night. The first visit was in the company of The Best Husband Ever, Delightful Daughter and We're Watching You Boyfriend, who simply could not wait until after the arrival of my sis and brother-in-law, whose flight from Vegas was delayed a couple hours. Must. Have. Sweet Peaks. Now! The second visit was with sis and brother-in-law, who buckled up into my car at 9:41 PM and immediately asked, "Are we gonna make it to Sweet Peaks before they close?" at 10:00 pm. Since I have my priorities straight, we made it with 4 minutes to spare. And for al of this, we are thankful.